Munster coach Johann van Graan doesn't expect to have Conor Murray back next weekend in an effort to increase his game time. Murray has been struggling for form after missing the early months of the season through injury but Van Graan expects the scrum-half to remain in national camp rather than make a move to make him available for their trip to Scarlets this weekend. Van Graan said out-half Joey Carbery could be out "for a few weeks" but he is hopeful that he might be fit for the France and Wales games and be in top form when they take on Edinburgh in the Champions Cup quarter-final at the end of next month. 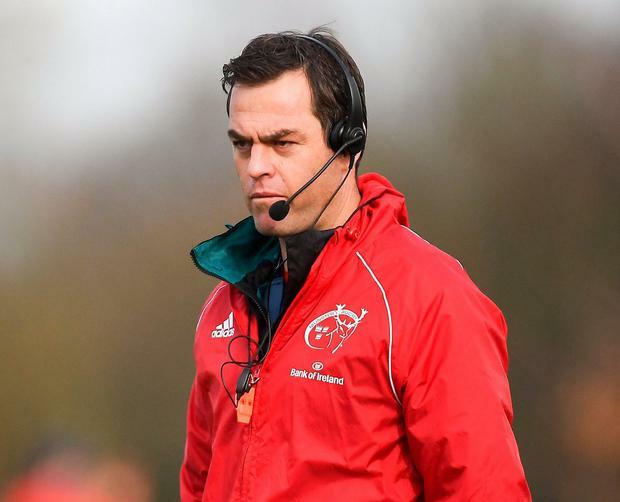 "He will remain with the national team," said Van Graan at Munster's weekly press conference at their high-performance centre in Limerick yesterday morning. "He will be out for a few weeks with the hamstring injury. We will just take our time week by week. Our medical team and their medical team will stay in contact. Hopefully we will have him back soon. "It's a hamstring injury and it takes a bit of time to settle. Obviously for us it's a worry that he is hurt. "He is one of our best players and we would love to have him for that game against Edinburgh but that is still a very long way down the road. "Hopefully he will be back for Ireland against Wales or against the French." And CJ Stander could make it back in time for Ireland's clash with France, as Van Graan was due to chat with Joe Schmidt yesterday evening about the condition of his Munster players. Van Graan has spoken in recent weeks about how he expects scrum-half Murray to return to top form but while a lack of game-time after injury has been cited as one of the reasons for his form, the Munster coach doesn't expect him to be made available for their trip to Parc y Scarlets on Saturday. "Anything is possible but I don't foresee him to come back (this weekend). He is the number one starting scrum-half in Ireland," said van Graan. "That is not my decision, that is Joe's. We would love all of our guys back but this is Six Nations time. The national team always comes first. "Whoever we get for the weekend we will be happy with. But whatever the national team needs we will assist them. We will just await the communication from Joe." Munster are away to Scarlets at Parc y Scarlets on Saturday afternoon where they will look to remain top of Conference A in the PRO14 with a win. Lock Tadhg Beirne earned the man-of-the-match award for his performance in the 19-13 win at Ospreys last weekend after being released late in the week from national camp but Van Graan isn't sure whether he will available against his old club this coming weekend.